It's Just Mobolaji | Music & Entertainment: A$AP Ferg Headlines Converse Gigs @ 100 Club in March! A$AP Ferg Headlines Converse Gigs @ 100 Club in March! "Shabba Ranks, Sha-Sha-Shabba Ranks! 8 gold rings like I'm Sha-Shabba Ranks!" 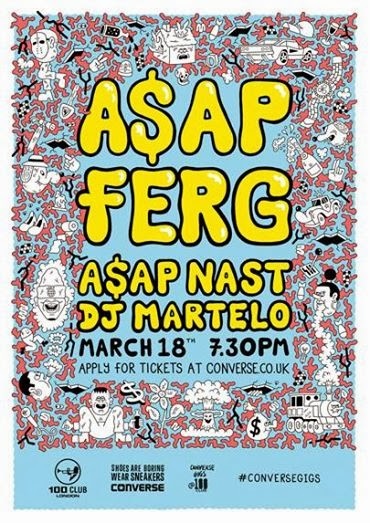 Is what fans will be chanting alongside A$AP Ferg next Tuesday at Converse Gigs at London's 100 Club. Ferg will be following in the footsteps of previous hip-hop headliners at the 100 Club including Nas, Ghostface Killah and Joey Bada$$ who have all headlined on the famous stage. The New York rapper and self-proclaimed "Trap Lord" will headline the March edition of Converse Gigs. Not hitting the stage alone, A$AP Ferg will be joined by his fellow A$AP Mob member - A$AP Nast for this one off show, and DJ Martelo will be spinning on the wheels of steels. Fans will be happy to know that tickets for this show are FREE and A$AP Ferg will be performing songs off his debut album Trap Lord released back in August 2013, including his hit singles 'Shabba Ranks' and 'Work'. Support on the night comes from fellow mob-member A$AP Nast whose verses with American rapper - Method Man (Wu-Tang Clan) feautre on the A$AP Mob's latest single 'Trillmatic', released December 2013. Tickets for this event are FREE and are only available exclusively via the Converse UK website converse.co.uk - once you apply!